It’s a Drag… … Racing, that is! had me puzzled at first: how can you drive extremely high powered vehicles down a virtual 1/4 mile? But, as I live by the motto “try most things ones”, I didn’t have to think long before saying “yes, I’m game”. 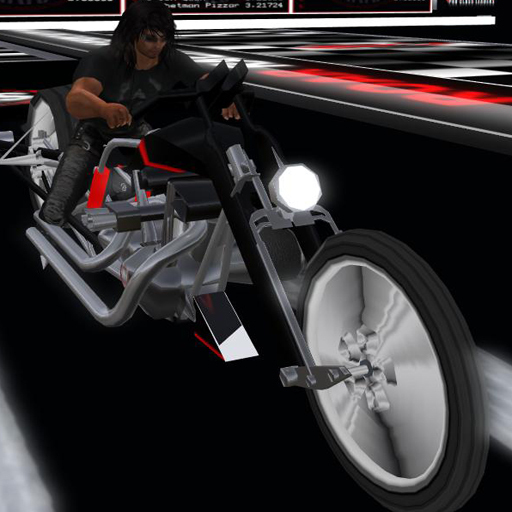 Time to stage (put your vehicle in the starting position and gear) and hit the accelator when the yellow light comes on… I must tell you, it’s unlike anything I’ve experienced in Second Life! A race lasts… one second! After getting a few pointers on what to do, we had a few races between us (somebody even offered us the use of his car) and I must say: Izzie by far has the best reaction speed overall, although I did beat her best: 0.06 seconds after the yellow light went on I hit the accelerator. Trescool mentioned that anything under 0.05 is usually a winner, and he was correct: I saw reaction times of 0.02 seconds!!! reaction sweet spot. Another one is take your time, after 3 runs I was hooked! Pingback:	Quick update… « Hyxified… and Goodnight!